In 2011, we launched the Mosaic Hollywood location making Hollywood Mosaic’s singular focus, using the 7107 Hollywood Blvd property as a platform to reach the world. The time has come for us to become homeowners, to lay a foundation on the very corner where we have watched tens of thousands of lives transformed by the love of Jesus. We are at a crucial moment in Mosaic’s history - if we don’t buy the building now, we will have to find a new home. The building purchase price is $20 million and our first goal is the deposit - $5 million. From the initial 300 attendees on Easter in 2012, we’ve seen our community grow to over 10,000 on Easter in 2018 across six campuses. Mosaic has become an invaluable asset to the local community, with a global reach to over 71 countries. When my family moved to Los Angeles over 25 years ago, we came with the conviction that Los Angeles was the epicenter of human creativity. Creativity is the unique economy of Hollywood, and in the same way that Los Angeles inhales the world’s talent and beauty, it can exhale the gospel. While Mosaic’s influence spans the globe, the incubator for its unique message and culture is created out of the context of the unique culture of Los Angeles, and specifically Hollywood. Mosaic has stood together in moments of triumph, compassion, hope, faith, and love. We cannot miss this miraculous moment to buy our present property and make it our permanent home. If you are committed to the mission and message of Mosaic, we invite you to join us in this endeavor through your sacrificial giving. This once in a lifetime chance can only be seized if we all do this together. 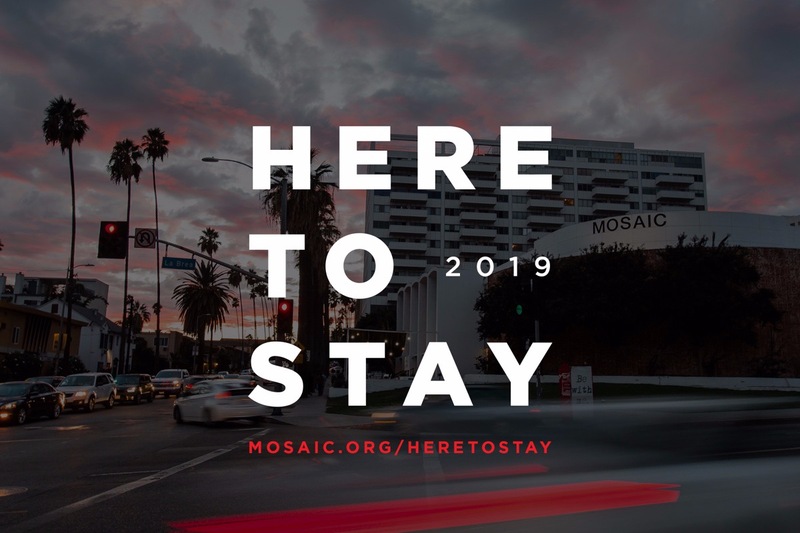 In a city where no one moves to live forever, Mosaic has made the decision that we are here to stay. This is our challenge. This is our story. Will you be a part of making history with us? If we do not reach our goal to purchase the Hollywood property, all funds will be used to impact Los Angeles and our mission continues. Mosaic is a 501c3 Non-Profit and all gifts are tax deductible. 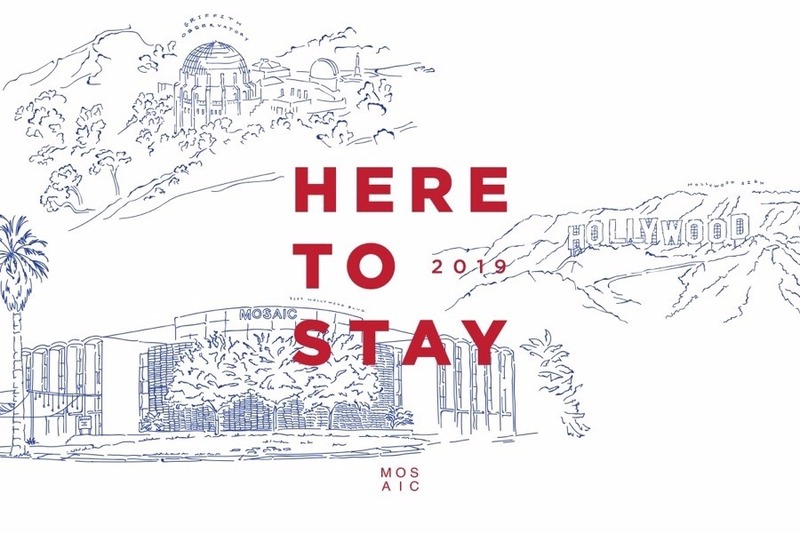 In the first week of Here to Stay, together we have contributed over $2.1 million to own our Mosaic Hollywood home. Thank you to all 1100+ people who have sacrificed and contributed - we can’t stop now! We’ve raised 40% of the initial $5 million goal and you can still be a part of Here to Stay! Keep sharing the story of Mosaic and why you are Here to Stay with us on social media and within your community. Awareness creates movement and the momentum of your giving will inspire others to contribute toward owning the Mosaic Hollywood building! If you missed the original announcement, you can view it at the link. $1 MILLION! Thank you to everyone who has donated! Let's continue to share this message and help spread the word that we are HERE TO STAY!!! In 24 hours we have contributed over $500k to Here to Stay - this is an incredible beginning. Your sacrifice is the context for a miracle! We have more ground to cover - we’ve only raised 1/10 of the initial $5 million goal.